Digital Design students from the Delaware Area Career Center pose with their Emmy award Friday at the DACC South Campus. From left to right: Cyrus Adkins, Avery Latta, Gibson Davis and Chris Skomra. The students won an award in the Short Form - Fiction category for their video “Deprived,” which is about the benefits of sleep for teens. The crew who worked on the Emmy award-winning music video, “3-on-3 for DACC,” pose with their Emmy award Friday at the Delaware Area Career Center. Pictured, left to right, are: Back row — Louis Dykstra, Chris Skomra, Matt McKay, Cyrus Adkins, Avery Latta and Gibson Davis; Front row — Hannah Peterson, Delta Clark and Casey Campbell. 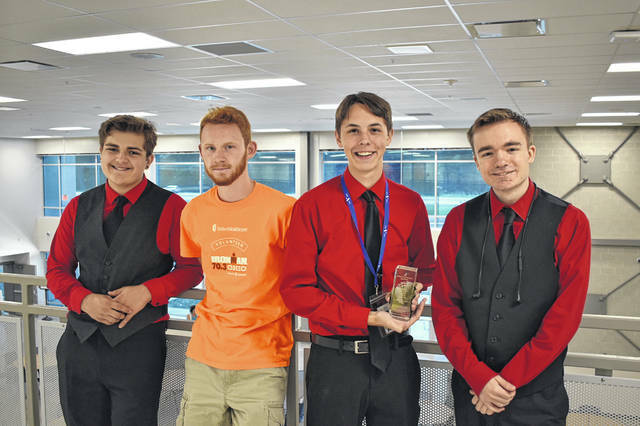 Students not pictured that won the Emmy: Jake McComb, Alex Kropp, Michael Guzman and Noah Fisher. Digital Design students at the Delaware Area Career Center recently walked away with two Emmy awards from The Ohio Valley Chapter of the National Academy of Television Arts & Sciences. Skomra said the students created the video for a Business Professionals of America (BPA) competition and submitted it for Emmy consideration afterwards. Skomra said the video was created to show the benefits of teenagers getting regular amounts of sleep. “We had high hopes, but however far we get, we are very thankful and grateful,” said Adkins. Davis said the award reaffirms that the team works well together. Latta said as the group goes forward into their senior year at the DACC together, they want to become more efficient. “I think this definitely opens up more opportunity for us as a group and more opportunities to get better,” Latta said. Skomra said his group wants to spend their senior years helping out the junior class. The team thanked their instructors at the DACC, Josh Gallagan and Wil Rowland, and praised the work of Grant Brooks, the actor who appeared in the short. Brooks was also awarded an Emmy. Adkins thanked his family and said some thanks must also go to Taranto’s Pizzeria, where the group met every day during production of the video. “We met there once a day every week for two months, and they were happy to host us,” said Davis. 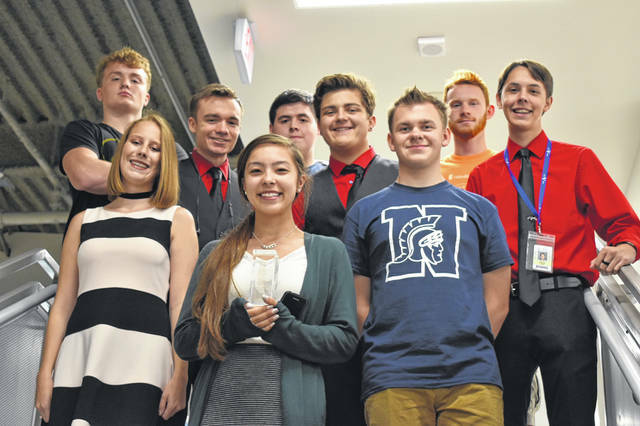 The group also helped create a music video that also won an Emmy award along with fellow DACC students Delta Clark, Louis Dykstra, Jake McComb, Casey Campbell, Alex Kropp, Michael Guzman, Matt McKay, Hannah Peterson and Noah Fisher. Clark said the music video was titled “3-on-3 for DACC,” and said the project was “really crazy.” Clark said the project began by Skomra inviting basically anyone who was interested in helping making this music video about the DACC to come work on the project. The video was created for the Ohio School Board Association and its “Stand up for public schools” competition. “We lost the competition!” Peterson laughed. Clark said one judge from the OSBA gave them a “zero” for their video. Peterson said everyone learned from the feedback from the video. Clark said the video was shot in a single take that involved moving the camera on a tripod with wheels, and an entire day of rehearsals. Skomra said the next day the crew nailed the video on the sixth take. According to Clark, the video, its production and success, changed her life. “Deprived” and “3-on-3 for DACC” can be viewed on YouTube. Digital Design students from the Delaware Area Career Center pose with their Emmy award Friday at the DACC South Campus. From left to right: Cyrus Adkins, Avery Latta, Gibson Davis and Chris Skomra. The students won an award in the Short Form – Fiction category for their video “Deprived,” which is about the benefits of sleep for teens.